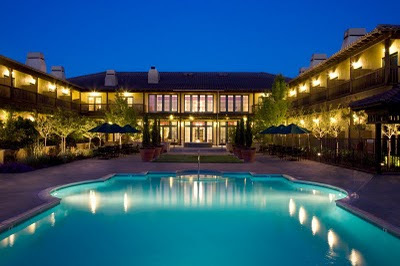 The Lodge at Sonoma Renaissance Resort & Spa 1325 Broadway Ave., 1 mi. S of town, (707) 935-6600. 182 rooms. Some gas fireplaces. Restaurant. Pool; hot tub; fitness center; health spa. Luxurious spacious grounds planted with well-tended gardens are the backdrop to spacious tri-plex cottages. Rooms feature clean-lined contemporary decor with deep soaking tubs. The spa has eucalyptus steam rooms as well as an pleasant outdoor area with natural mineral water soaking pools and open-air treatment and lounging cabanas. Complimentary shuttle service is available to the downtown plaza. Operating in a large airy room with an open kitchen just across the entryway from the hotel lobby, the comfortable Carneros Bistro & Wine Bar ((707) 931-2042. B&D daily, L M-Sat, SunBr; $$$.) offers a menu of locally sourced contemporary cusine. Entrees include a tasty American kobe flank steak with wild mushrooms, mac and cheese made with Midnight Moon goat cheese, interesting flights of wines, and dessert trios in strawberry and lemon. All are matched with wine suggestions.